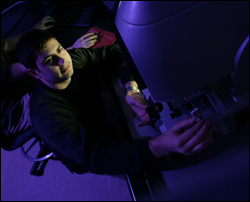 Stephan Koev, a Ph.D. student of Herbert Rabin Distinguished Associate Professor Reza Ghodssi (ECE/ISR), has won a university-wide graduate student research contest and is featured in the February 2009 issue of Research@Maryland. Koev is developing a type of MEMS sensor known as the microcantilever. The device contains a tiny beam with length close to the thickness of a human hair. When target analyte molecules such as DNA bind to the selective surface coating of the beam, it is slightly deflected. This effect has been known for years, but the measurement of the nanometer-level beam deflection required complex, bulky experimental setups and the sensor could not be made portable. Koev has developed a method for measuring the beam deflection that eliminates the external setup. The method makes use of integrated optical waveguides placed in line with the microcantilever. The beam deflection modulates the power of transmitted light, which is measured with a compact photodetector. The University of Maryland's Division of Research publishes Research@Maryland several times per semester. The publication's goal is to better inform and connect the research community at the University of Maryland.